Air Fryers – Is Their Popularity Justified? Is air the new oil? Air Fryers are the newest cooking trend, rapidly catching up with the Instant Pot for kitchen appliance popularity. Air fryers have been on the market since 2010 but only in the last year have they claimed their marketplace share. They are small convection ovens that concentrate both heat and circulating hot air in a small space. Food goes into a basket that sits under the heating element and is exposed to the circulating air. Most air fryers have time and temperature controls between 200 and 400 degrees. Traditional fried foods such as meat, potato chips, fries and chicken are cooked quickly and easily in air fryers. Only one tablespoon of cooking oil is used if any at all, and studies have shown that air fried foods are lower in calories and fat. Food cooked in an air fryer has a crisp exterior, and a moist interior. Food cooks quickly and efficiently. Air fryers are versatile and most can be used to air fry, stir fry, reheat, bake, broil, roast, grill and steam. Air fryers do not produce fried food that tastes exactly like typically fried food. Some have had quality issues with their plastic parts not holding up. They do not hold enough food for a large family. The Bella Hot Air Fryer 14538 has a 2.6 qt. capacity, no pre-programmed settings and comes with a 2-year warranty. Its parts are dishwasher safe. It is 13”H x 10”W x 14”D. No oil is needed to cook. $55.00. 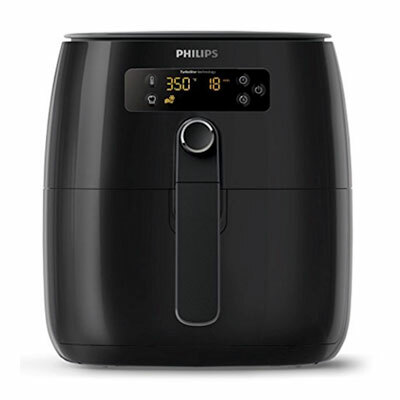 The Philips HD9641/96 Digital Turbostar Airfryer cooks food evenly and has a ‘Quick Control’ dial that is easy to use. 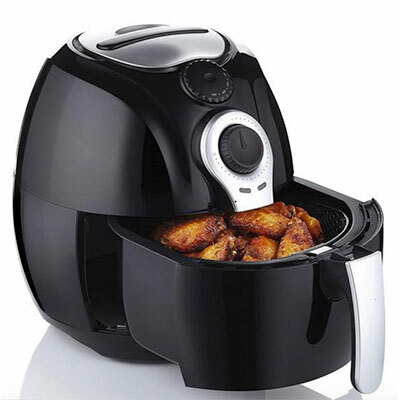 It is among the largest of the best air fryers at 16.6L” x 12.4W” x 11.9H”. $245.00. 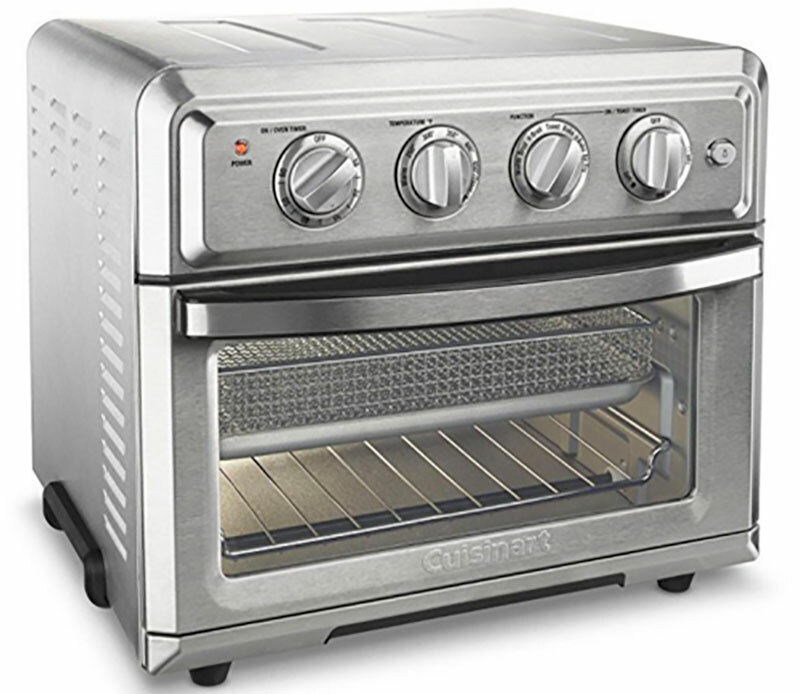 Cuisinart TOA-60 is an air fryer, but also a toaster oven and a convection oven. It is larger than many other air fryers and has a 0.6 cubic foot interior. It is 15.5”L x 16”W x 14”H. It has an adjustable thermostat, a 60-minute timer and many accessories. $199.00. The Power Air Fryer XL has a 3.4-quart basket with a non-stick coating. There are seven preset programs and a recipe book. The fryer heats up to 400 degrees. All the accessories are dishwasher-safe. There is also a 5.3-quart model. $135.00. The SimpleTaste 1400W Multi-Function Air Fryer has 8 preset programs for fries, chicken, shrimp and meat. 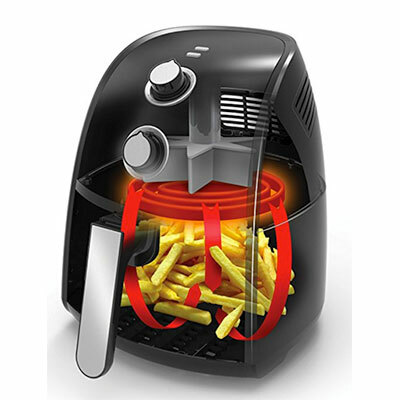 The fryer circulates air between 170 and 400 degrees and has a 3.2qt capacity which will feed a family of four. $99.00. 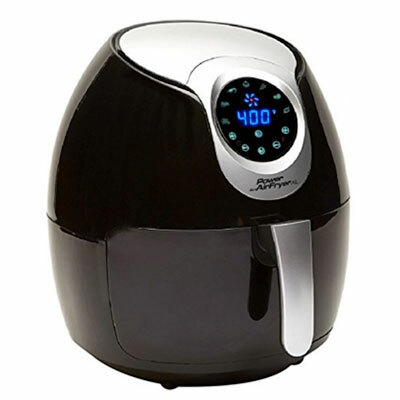 The Avalon Bay Air Fryer has a timer up to 60 minutes and a temperature setting up to 400 degrees. It has a 52-page recipe book and a 90day return policy if you don’t like it. $69.95. Clean the shrimp and set aside. In a small bowl, whisk the coconut milk and season with salt and pepper. Set aside. In a separate small bowl, whisk together the coconut, panko, cayenne pepper, salt and pepper. 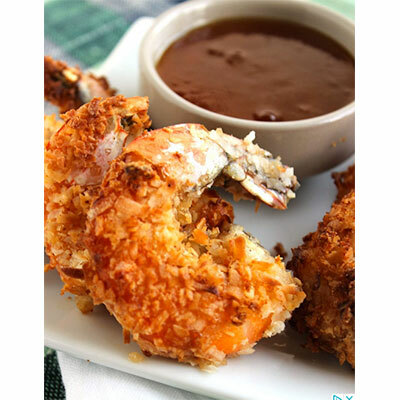 One at a time, dip the shrimp in the coconut milk, the panko and then place in the basket of the fryer. Repeat until all the shrimp are coated. Cook the shrimp in the fryer for 20 minutes at 350 degrees or until the shrimp are cooked through. While the shrimp are cooking, whisk together the marmalade, honey, mustard and hot sauce. Serve the shrimp with the sauce immediately. Recipe courtesy of The Suburban Soapbox.